The infuriating thing is that the BBC can be both so good and so bad within a very short space of time. On Saturday's CD Review on Radio 3 Jonathan Swain reminded us just how good the BBC can be. His review of the available recordings of Ralph Vaughan Williams' Job - A Masque For Dancing was a textbook example of informed and intelligent radio. His advocacy of the work was so powerful that I listened again to Tod Handley's 1984 LP of this overlooked masterpiece as soon as the programme finished. The bad thing is that Jonathan Swain, and several other excellent presenters, have been sidelined to specialist review and overnight programmes as Radio 3 continues to trade excellence for access. Clearly BBC director general Mark Thompson never listened to Russell Brand on Radio 2. I also suspect that Radio 3 controller Roger Wright doesn't spend enough time listening to his own station's output. Jonathan Swain's passionate case for Job was a million miles from the cool and ironic style loved by the New York in-crowd. If I need reminding why I hate cool and ironic I will return to Sequenza21's recent interview with composer Rodney Lister and his comments about Vaughan Williams' Sea Symphony. The antithesis of cool and ironic was Dutch blogger Rolf Otterhouses' impassioned 'I am so bloody angry!' on YouTube. Rolf was one of many passionate people who spoke out about the threatened closure of Dutch classical webcaster Concertzender. And their passion has produced results. Last week I reported how the Dutch culture minister had intervened in Concertzendergate. This has been followed by even better news. First the Rotterdam programme council ruled that Concertzender must be included in the city's cable programming. Then the Dutch culture minister announced he would accept a submission from Concertzender presenting their case for staying online. The moral of this story is that being cool and ironic gives the in-crowd a nice warm feeling; while getting bloody angry actually makes a difference. Many thanks for bringing Concertzender to my attention. I have wanted to hear more Dutch music since I was at chool (in Norfolk) over forty years ago, and now I can't believe my good fortune. Interestingly, the Ottawa Symphony Orchestra performed Job just last week (November 18th) and received amazing reviews. What is really interesting about this is that the orchestra consists of players from the "back desks" of the National Arts Centre Orchestra, students from the music program at the University of Ottawa, and amatuers! A difficult score pulled off with great aplomb, which is actually typical of this orchestra. On the same program, they performed the Four Sea Interludes. I did, after all, say that I loved the Sea Symphony, which is true. I'm not sure that I'd characterize my comment as ironic, and, although coolness is in the eye of the beholder, I've never been aware of being considered such by anybody. That you do is a compliment. I'm also not aware of having had a nice warm feeling about it. I guess I just have a job decoding all this cool and ironic stuff. Well, the sentence before the one you quote says "I love the Vaughan williams Sea Symphony." I'm not sure how difficult it is to decode that. 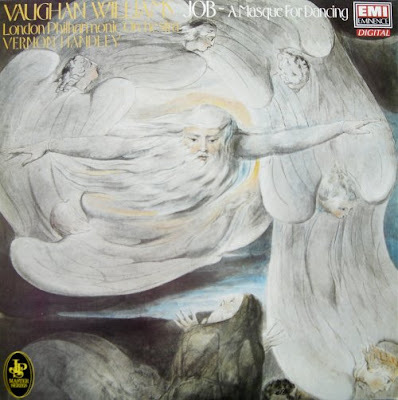 Perhaps you missed a rather long posting I did after the all Vaughan Williams Proms, which talked about the 9th Symphony at length, and, at least I think, unambiguously admiring and respectful. (Although I have to admit not to having the same admiration about the Piano Concerto and the 6th Symphony) which I also wrote about before then.